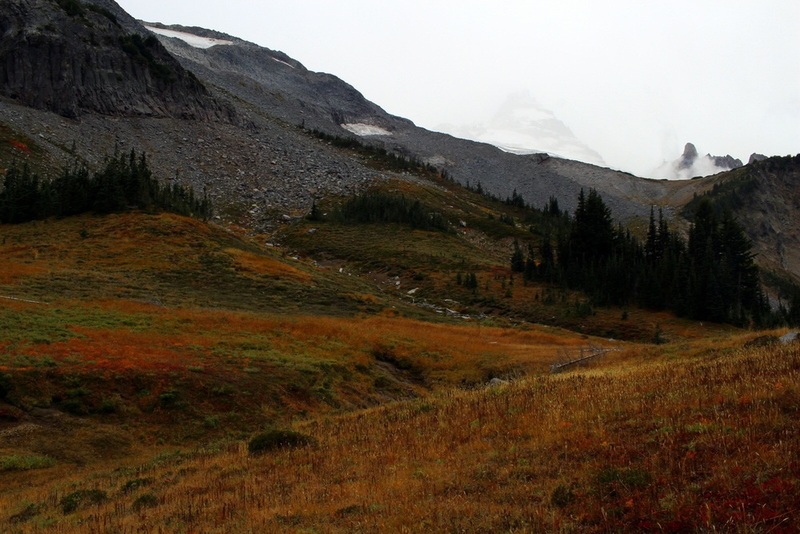 When I signed up to do the Wonderland Trail, I did not sign up for snow, bone-chilling winds, and heavy fog. 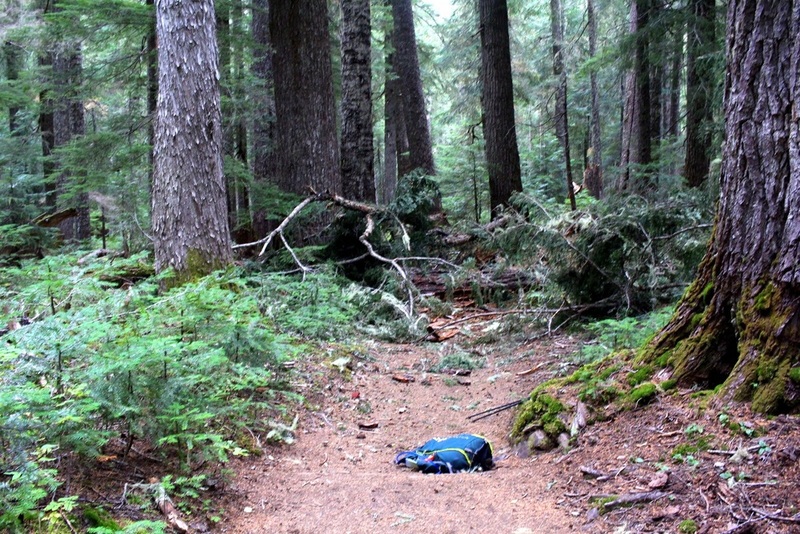 This about sums up my day today on the Wonderland Trail--the 93-mile trail that encircles Mount Rainier. I'd left Yakima at a decent hour, and managed to get to the wilderness center in the White River entrance by 10 a.m. I looked up trail conditions and asked the on-duty ranger about how difficult the trail was from Fryingpan Creek to Indian Bar. He said the trail was in great shape, and that I should be able to do it no problem. A little bit into our conversation, he received what appeared to be an urgent call. There was an ongoing incident, perhaps a fatality. I wished him luck and went on my way. While driving to the White River campground, I could see very little. The fog had rolled in and covered everything in sight. As I was arriving at the White River campground, I could see, far off in the distance, and ever so faint, Mount Rainier. I hoped that the sun would come out and kill the fog. I quickly set up my tent in a secluded area surrounded by tall trees. Cozy. By 11:15, I was at the trailhead, ready to run the famed Wonderland Trail. It was surprisingly cold. So much so, that I actually began my run with tights, windbreaker, and gloves. As has become typical practice, I began by proceeding through a forested section. The trail was wide and flat--perfect footing to start the day. I'd chosen a section that basically involved a 3,500-foot ascent right from the get-go. So there was very little running involved. Instead, I went up switchbacks through the forest. I was getting hot. I shed my layers. It's always fun to look down from above, and see how the trail switchbacks up a hill. 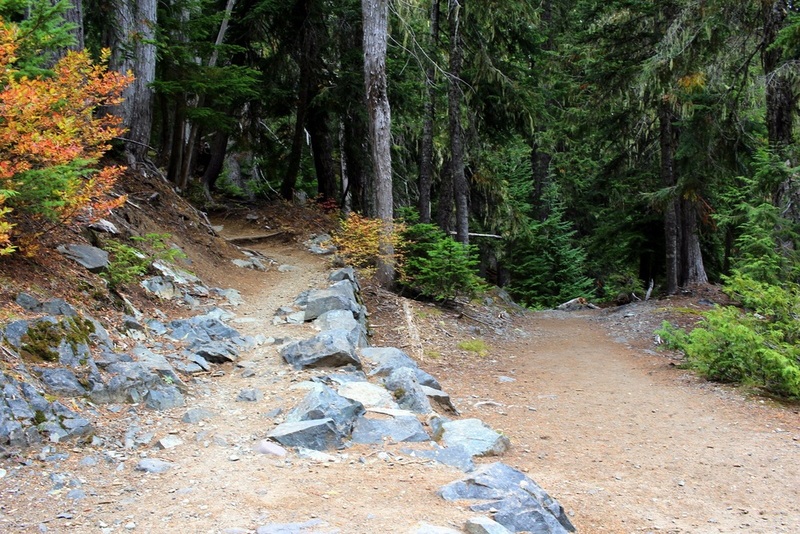 I eventually reached the end of the forested section and popped out into the famous Summerland area of the trail. This was a wide meadow, typically overflowing with colorful wildflowers. Apparently, because there was less snow this season, and because it was hotter this summer, the flowers had already bloomed and died. I saw the remnants (kind of like arriving two days too late to see the cherry blossoms in the Tidal Basin in D.C.). From Summerland, I could see the edges of Mount Rainier, shrouded by snow, fog, and clouds. 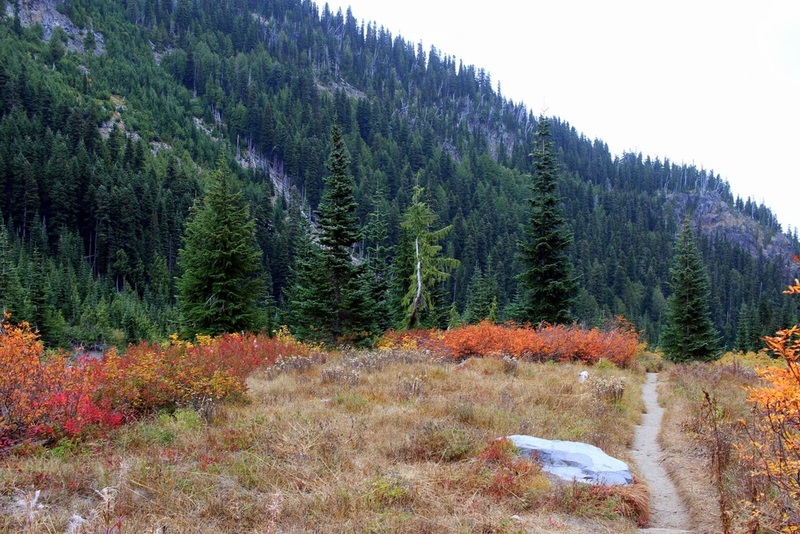 Between Summerland and Indian Bar, hikers pass through Panhandle Gap, which is the highest point on the 93-mile trail. I began my ascent towards the Gap on wooden stairs. I stopped by a stream to fill up water. After topping up, I realized my body felt somewhat rigid. As I continued hiking, I then noticed precipitation--it was snowing. I'd not expected snow. I'd seen the fog, but I didn't realize that, inside that fog, there was also snow. Thankfully, not only had I brought a wind shell, but I'd also brought my thicker fleece. I quickly put that on and proceeded up to the Gap. I reached the gap, and all of a sudden, everything grew quiet. There was no wind, and almost no sound. All I could hear was the crunching of the dirt or rocks beneath my feet. The fog had rolled in even thicker by now, and visibility was decreasing. I became a little more cautious now. I was over 6 miles in, and wanted to see if I could make it to Indian Bar, but I also didn't want to get stuck in the cold (especially because I was still battling my own common cold), or in the creeping fog. The trail was easy enough to follow, so I continued, albeit slowly. This place felt eerie. I also felt a little bit like Beowulf, tiptoeing through barren land in search of Grendel. I was all alone, and all I could see was fog. Eventually, I reached the end of Panhandle Gap. I began the 3-mile descent into Indian Bar. I soon realized that, each step I took down would be a step I'd have to take back up. I hadn't seen much in terms of scenery, and was starting to feel chilly. I decided I'd be better off turning around and heading back. So, after 7.5 miles, I turned around. The way down was easy. It got progressively warmer, and the fog got progressively less thick. I was able to get a clearer view of the Fryingpan Glacier (I think this is it). Right before reaching Summerland again, I was in what I could tell was the most scenic part of the trail--if only the fog were gone. The rocks were brilliantly colored, kind of like pastel-colored Fruity Pebbles. I rested by the stream, rehydrated, and looked at the faint outline of Mount Rainier that I could see. I continued down to Summerland. I could immediately picture what this place would look like in full bloom. I decided that I would come back some day and run the entire 93-mile loop--in nice weather. The descent back to the trailhead was peaceful. I passed one group of hikers that asked me about the conditions up in Panhandle Gap. They were worried that the weather would only get worse tomorrow. I told them to wait. It couldn't get much worse. When I was only a mile from the trailhead, I noticed that a massive tree had fallen across the trail. This was not here when I started, so it had happened within the last couple hours. Seeing this made me realize just how important it is to be aware of one's surroundings. Normally when I run, I run with my iPod Shuffle. I was glad I'd not listened to music even one on this trip. I finished right around 4 p.m. It was a slow, peaceful day, and I hadn't quite seen the picture-perfect views that one expects from the Wonderland Trail. But it had turned out to be an exhilarating day navigating through snow and fog. I'd come off the trail a bit chilly, but otherwise felt completely fine. 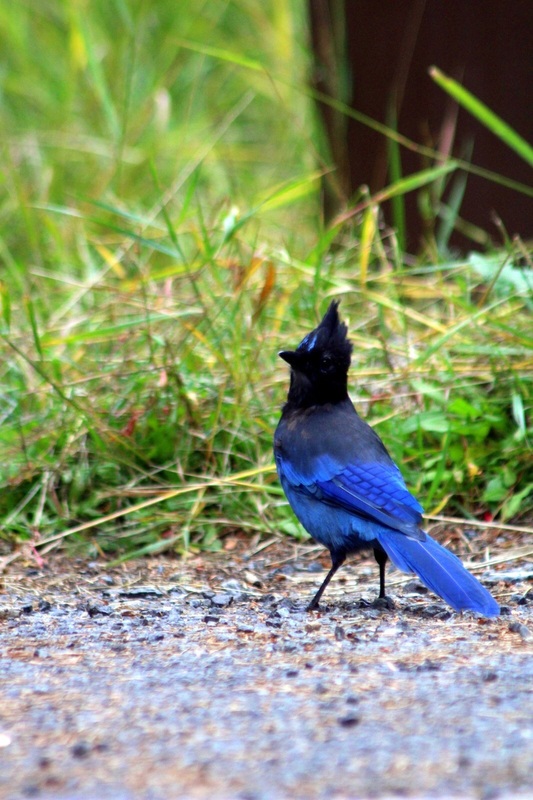 As I returned to my campsite, I noticed a blue bird on the side of the road. He seemed inquisitive, and kept squawking as I followed him around, trying to take a photo. 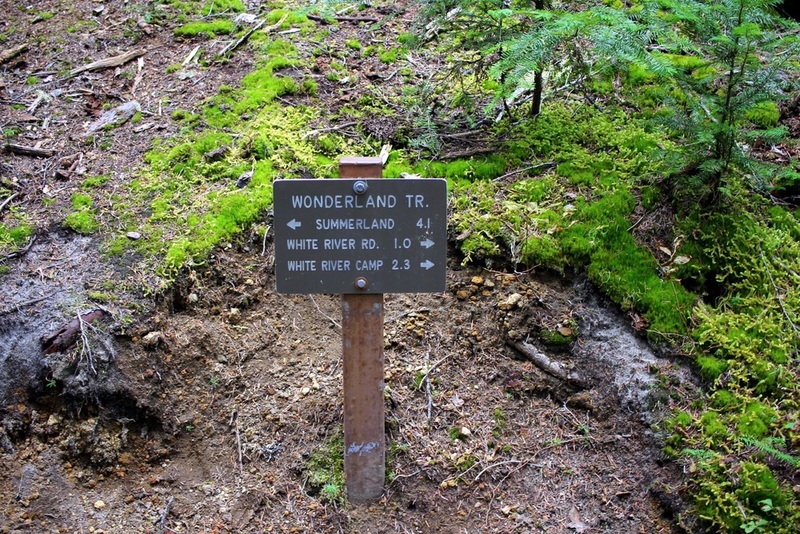 The Wonderland Trail is aptly named. I had a great 15-mile day, but I ended the day with a lot to wonder about.